There are several locations in the northern Russian Arctic associated with large amounts of sulphur dioxide (SO2) emission into the atmosphere. They are known as smelters, and they could have the largest environmental and health impacts. These are the Russian enterprises located in the cities of Norilsk (Krasnoyarsk Krai), Mochegorsk and Nikel-Zapolyarny (Murmansk region). Information about environmental and pollution situation in these regions of Russia is provided through annual state reports. A series of studies was performed as a part of the Russian state scientific-research programmes, Kola Science Center and Siberian Branch of the Russian Academy of Sciences projects, Arctic Monitoring and Assessment Programme activities, and others. The modeling of atmospheric transport, dispersion and deposition of different pollutants is essential input for estimation of possible consequences on different scales ranging from hemispheric to urban/ local scales. Estimates of transboundary transport between selected countries is especially important for a decision making process. Generated model output is crucial for multi-level assessment of risk, vulnerability, impact, short- and long-term consequences for environment and population, which is living near-by or remotely from the sources of possible accidental releases and continuous emissions. The long-term modeling of the atmospheric transport, dispersion and deposition of pollution resulted from continuous emissions from the Russian smelters was performed employing the Lagrangian-type Danish Emergency Response Model of the Atmosphere (DERMA; Sørensen, 1998; Baklanov et al., 2008). At current moment the Pan-Eurasian EXperiment programme (PEEX) network includes more than 4000 researchers worldwide. The existing PEEX dissemination platform and communication tools will be used for presenting and promoting the TRAKT-2018 project (TRAnsferable Knowledge and Technologies for high-resolution environmental impact assessment and management) for the PEEX community. The information is distributed through the PEEX official website (https://www.atm.helsinki.fi/peex - in English, Russian and Chinese), e-news, instagram, twitter (https://twitter.com/PEEX_News), e-mailing list (https://www.atm.helsinki.fi/peex/index.php/peex-e-mailing-list), newsletters (https://www.atm.helsinki.fi/peex/index.php/newsletter). So far the PEEX programme signed more than 30 PEEX Memorandum of Understanding (MoU) with universities and research institutes in Russia and China (https://www.atm.helsinki.fi/peex/index.php/mou). As part of the TRAKT project, during the official kick-off-meeting (22-24 Jan 2018, St. Petersburg, Russia; Fig. 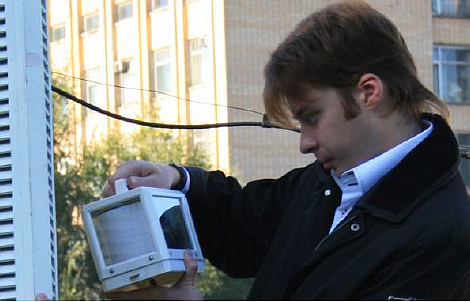 1) such MoUs were signed also with 3 Russian partners involved into the project – the Nansen International Environmental and Remote Sensing Center (NIERSC; http://www.niersc.spb.ru; St. Petersburg), the Scientific Research Center for Ecological Safety (SRCES; http://ecosafety-spb.ru; St. Petersburg) and the Kola Science Center of the Russian Academy of Sciences (KSC RAS; http://www.kolasc.net.ru/english/index.html; Apatity, Murmansk region). Moreover, basic information about the TRAKT project is linked to the PEEX official website and available at: https://www.atm.helsinki.fi/peex/index.php/trakt-2018. The TRAKT activities are well linked with two PEEX focus areas (Fig. 2) such as the “Knowledge Transfer” and “Impact on Society”. The “Knowledge Transfer” focus area directs towards educational programs at multiple levels, strengthening future research communities, and raising awareness of global changes and environmental issues. And in particular: (i) to educate the next generation of multidisciplinary experts and scientists capable of finding tools for solving grand challenges; (ii) to increase public awareness of climate change impacts in the Pan-Eurasian region; (iii) to distribute the new knowledge and data products to scientific communities and the public sector; and (iv) to deliver tools, scenarios and assessments for climate policy makers and authorities. The “Impact on Society” focus area addresses key aspects related to mitigation and adaptation strategies. It also involves planning for preparing northern societies to cope with environmental changes, developing reliable early-warning systems, and addressing the role of new technology in the implementation of these strategies and plans. As part of the PEEX Working Groups meeting (scheduled for 1-2 November 2018, Helsinki, Finland), the TRAKT partners were invited to present the achieved results to a wider PEEX community. TRAKT is also invited to contribute to the 4th PEEX Science Conference (2019, Helsinki). Materials and results of the project are expected to be included into lecture courses at Universities. In addition, the INAR-UHEL team is also agreeing to provide the Enviro-HIRLAM model through signing agreement on the model code transfer and use for research, development and educational purposes for the project partners. A closer involvement and project contribution are also expected as part of the PEEX climate policy making and to international forums, decision-makers and national authorities (see more information in the PEEX Science Plan, sections 5.2 & 6.1). Field training for Moscow State University Bsc and Ms students based in Polar micro-meteorological observations in Arctic area (2-5 February 2018) in Velikiy Ustug. Archangelsk pressa wrote: "Климатология городов продемонстрировала внушительные темпы развития в течение последних 20 лет, по этому показателю она опережает другие науки о Земле. До недавнего времени микроклимат городов арктической зоны оставался практически не изученным. Совместный проект ученых из Норвегии, России и Финляндии под названием «TRAKT-2018» призван устранить этот пробел. В качестве его основной задачи рассматривается разработка новых методов моделирования климатической обстановки и качества воздуха в населенных пунктах Кольского полуострова, а также информирование жителей о текущих проблемах природной среды. В рамках проекта ученые из МГУ планируют посетить Апатиты и прочитать лекцию в КНЦ РАН, посвященную проблемам климатологии городов, которые расположены в полярных широтах. После лекции участники «TRAKT-2018» собираются провести мастер-класс для студентов на Хибинской научной станции. Ранее в процессе полевых исследований были получены результаты, согласно которым в городах арктической зоны наблюдается значительно более высокая температура, чем за их пределами. Эффект особенно выражен в холодную погоду. Например, в Апатитах разница температур может достигать 10 градусов. Ученые связывают это явление с влиянием холмистого рельефа. В условиях постепенного изменения климатических условий точная информация о городском микроклимате будет основой для увеличения точности прогнозов погоды, роста эффективности градостроительного планирования и повышения комфортности проживания населения северных городов, считают ученые." 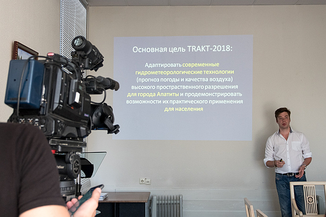 Within the framework of project "TRAKT-2018" on July 20, 2018, scientists of the Lomonosov Moscow State University have visited city Apatity (Kola Peninsula, 67°34′ N 33°23′ E) and have given a public lecture at the Kola Scientific Center of the Russian Academy of Sciences. 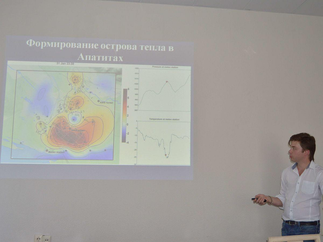 The presentation (lead by Dr Pavel Konstantinov and Dr Mikhail Varentsov) was devoted to the actual project, the issues of the uniqueness of the urban microclimate and the problems of urban climatology in the polar latitudes. At the beginning, Dr Konstantinov introduced to end-users scientific background of project for more than five years, MSU-based urban climate research team, in close cooperation with Kola Scientific center , has been studying the “heat islands” of large cities in the Russian Arctic. During his talk Dr Konstantinov noticed that urban climatology in the last 20 years is one of the most dynamically developing of Earth sciences. However, until recently, the climate of the Eastern Arctic cities remained virtually unexplored. During the meeting, discussions were held on the issues of the uniqueness of the microclimate of Apatity and issues related to the problems of the urban climatology of the polar latitudes. Invited to public lecture scientists of the Institute of Industrial Ecology Problems of the North, the Biomedical Center and the Center for Humanitarian Problems of the Barents Region, discussed the importance of the results and the development of cooperation. The importance of the topic and the expansion of areas of interdisciplinary research conducted by scientists of the Kola Scientific Center of the Russian Academy of Sciences was noted in an interview to the journalists of the Public TV channel of Kola Peninsula and the Murmansk Bulletin Journal by Vice-Chairman of the KSC, Dr. Sc. Galina Sousova. The interest to the event was shown by the Administration of the city of Apatity, whose representatives participated in the work of the Round Table ( Round Table was lead after public lecture). And this is not surprising, since these studies can be of considerable interest for utilities, especially during the heating season. 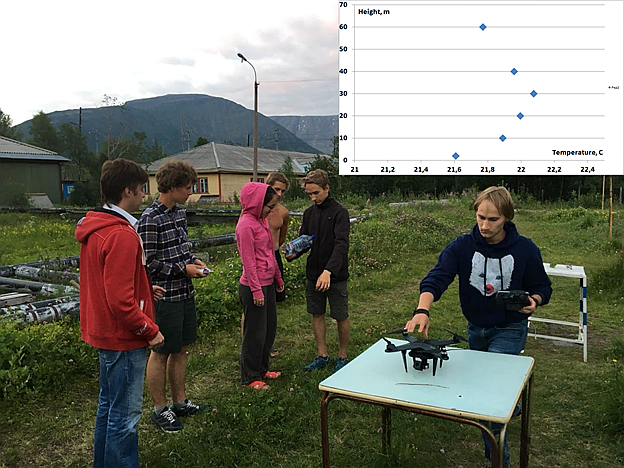 After public lecture, the project participants held a master class for graduate and master students of MSU Faculty of Geography at the Khibiny training and research station in Kirovsk-city. UHIARC installationAbsence of a dense meteorological network impedes development of urban climatology in the northern polar region where the global warming is rapid and amplified. High quality and density urban temperature datasets are required to monitor thawing processes in urban soils, properly assess and project trends in urban comfort and air quality as well as to estimate impacts of climatic extremes. This dataset presents data of Urban Heat Island Arctic Research Campaign (UHIARC) observational network, which has been deployed in several medium-sized cities of the Eurasian Arctic region in winter 2016-2017. The network comprises an array of air temperature loggers (iButton) and one automatic weather station Davis Pro in each of these four cities. The UHIARC observations revealed strong positive temperature anomalies in all four cities. These temperature anomalies, which are known as urban heat islands (UHIs), have mean wintertime intensities of 0.7K to 1.4K. Typical extreme intensities of 7.1K were observed during cold anticyclonic weather conditions. Such a strong mediation of the cold temperature spells by the UHI might induce considerable socio-economic and environmental impact in the cities. The data from the iButton TLs are provided on request as well as the data for other periods (including the latest observations) for the listed cities and also for Apatity (Murmansk region, Russia). The data are free exclusively for academic purposes, in case of publishing scientific results of processing of initial UHIARC info, the reference to the dataset and the source are mandatory. V.I. Gornyy, 2018: Space technologies for managing the risk of overheating of the urban environment of St. Petersburg in the context of global warming, presentation at the Round Table «Comfortable urban environment - the basis for safe regional development» at the 9th St. Petersburg Gas Forum, October 02-05, 2018. V.I. Gornyy, 2018: Parry of threat of environment overheating in Saint-Petersburg, presentation at Russian-German Roundtable devoted to the IPCC Report: Global Warming of 1.5ºC, organized under the auspices of the Russian-German Environmental Information Bureau (RNEI), public environmental organization «Friends of the Baltic», ITMO University.